It’s fast, it’s furious, it’s a world first. Break the Barrier launched in the summer of 2013 and immediately changed the way we power-boat on the Thames. Operating exclusively in the ‘High Speed Zone’ this is the speed experience which is just that – ALL SPEED! It is all revved up for 2017! Boarding at St Katharine’s Pier in the shadow of the iconic Tower Bridge, you set sail to a rousing “Best of British” soundtrack from the modern day back to the 1960's. Before you know it, we let rip! Pushing speeds of up to 30 knots (35mph!) the 12 metre long aero-dynamically designed fiberglass ‘Thames Rocket’ will twist and turn its way east flashing past Canary Wharf, the Cutty Sark, Greenwich & The O2 arena. There’s a chance to catch your breath as the vessel cruises through the marvel that is the Thames Barrier, before ‘Pulling G’ and firing up the 630hp twin four stroke engines to blast you home. There is plenty more music and memories along the way and with an expert Skipper and award winning guide on hand to keep you entertained, this is a jam packed 40 minutes that’ll leave you wanting to turn round and do it all again! ‘Break the Barrier’... Are you ready? Duration: 40 minute experience. Lasts up to one hour, including briefing, kit issue and around experience on the water. Please arrive at least 15 minutes prior to the booked time. Days of operation and timings vary throughout the year. Be sure to check-in with an LRV staff member at St Katharine’s Pier, at least 15 minutes before your scheduled sailing. St Katharine's Pier is situated nearby St Katharine's Dock, next to Tower Bridge on the north bank of the Thames, immediately in front of the The Guoman (Tower) Hotel. The address is St Katharine’s Pier, St Katharine's Way, Tower Hamlets, London, E1W 1LD. We were a party of 5, 2 adults and 3 children. This was a fabulous experience and worth every penny. What a great way to see London. The guide was very informative and the driver very fast!! The kids absolutely loved it and we took loads of photos. We felt totally safe throughout. Would definitely recommend. This experience was worth every penny!! It was 45 minutes of fun and speed. Would definitely recommend it. Amazing experience. Friendly, knowledgeable and professional staff. Would definitely do it again! This has to be one of the best tourist attractions in London. We had a fantastic time, and it was awesome. High speed, very professional staff and an exhilarating experience. Highly recommended! 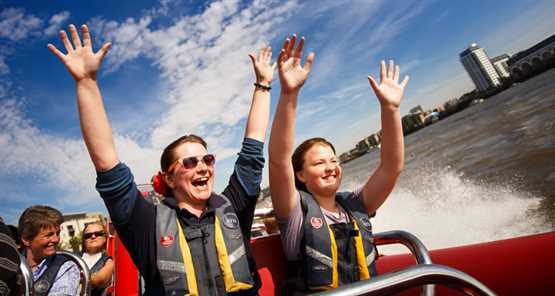 The alternative and definitely better way to see the sights from the River Thames! Fantastic experience for those who want to feel like James Bond! You get to see all the sights east of Tower Bridge in only 40 minutes (this is the section where the speedboat can go the fastest because there is a speed limit from the London Eye to Tower Bridge). Perfect for tourists and locals and would happily do again!! Please note: Due to maintenance work, please access the pier via the middle gangway, situated to the left of our kiosk. All images are for illustration purposes only and do not necessarily represent the event. Participant guidelines: Not suitable for under 10 year olds, under 14's must be accompanied by a participating adult. If you have ever suffered a serious back, neck or knee injury, we recommend that you seek medical advice before booking this experience. Pregnant women cannot take part. Spectators: Friends and family are welcome to watch from the shore, but won't be able to see much of the action. However, there is lots to see and do around St Katherine Dock while they wait. Instructions: Please be sure to check-in at least 15 minutes before sailing. Clothing: London RIB Voyages will supply all necessary clothing and safety equipment for all weather conditions. However, it does get cold on the Thames, so it is best to bring warmer clothing. Apart from that please dress as you like, you don’t get wet (at the most a little splash). Medical Conditions & Pregnancy: London RIB Voyages do not accept expectant mother aboard at any stage of pregnancy.